One of the greatest gifts a chicken can give is itself as a rich, delicious dinner. Sure, that may seem a bit weird, but it’s one of the primary uses chickens are bred for. However, there’s a downside to eating chicken if you don’t know what you’re doing. Prepared incorrectly, you could easily be dealing with a nasty case of salmonella. What is salmonella and how can you avoid it? Read on and find out. Before learning how to prevent it, you might be interested to know what salmonella actually is. Salmonella is a bacteria commonly found in the intestines of animals, though we associate the bacteria with chickens more than any other creatures. Should you ingest the salmonella bacteria, you may suffer from salmonellosis, or salmonella poisoning. Symptoms include stomach cramps, fever, and diarrhea, typically presenting within the first 12 to 72 hours of ingestion. In most cases, the worst you have to worry about is constant diarrhea, but if the infected party is very young, very old, or has an auto-immune disease, it could be a lot worse. So basically, this is something you want to avoid, yes? Though you could easily give up chicken, something vegetarians and vegans will tell you is not the end of the world, for most of us that simply isn’t an option we’d prefer. Thankfully, there’s a lot we can do to prevent salmonella from bothering us, all with some simple precautions. First, when purchasing raw chicken from the grocery store, make sure not to keep it in the same bag as other foods or items. There’s a reason that stores provide extra plastic bags in the meat sections, plus you’d be hard-pressed to find a bagger that doesn’t know to keep any raw meats separate from fresh produce or things of that nature. Next, when you do get home, make sure to stick your raw chicken straight into the freezer or the fridge if you plan on using it that evening. This seems like common sense seeing as how you don’t want it to spoil, but this also helps reduce the growth of the bacteria itself. To thaw the chicken then, put it in the fridge for six hours, place it in a bowl of cold water, or microwave it. Whatever you do, just know that once the chicken is thawed you shouldn’t refreeze it at least until it’s been fully cooked. One of the biggest steps is the proper cooking procedure. With chicken, you want to make sure you’re cooking it to the point that the internal temperature is 165 degrees Fahrenheit or higher. This is the breaking point where salmonella can be killed, so if you can get it above that temperature, there is virtually no chance the meat itself can pose any threats. For the best results, make sure to use a meat thermometer on this step. 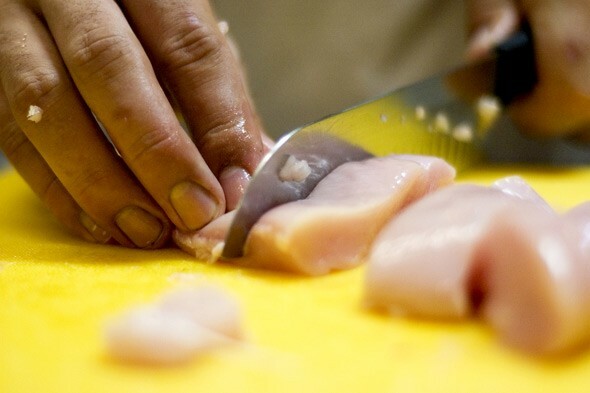 Lastly and possibly most importantly, everything that has come in contact with the raw chicken must be cleaned with soap and warm water. And this does mean everything, so your hands, any cutting boards, the counter, knives, tongs, forks, the meat thermometer, any and everything. Your hands especially carry the most risk, so flip on the water and wash for 20 seconds or more. Salmonella doesn’t have to scare you away from chicken forever. There’s that small risk, yes, but if you take the time to dine safely, there’s no reason you can’t enjoy your meal free from the worry of bacteria. Happy dinner!